"Hedge fund capital posted sharp gains to begin 2019 as investor risk tolerance increased," says Kenneth Heinz, president of Hedge Fund Research. The firm's index of hedge funds saw a 5.7 percent gain in the first quarter, the best start to a year since 2006. This year is off to a roaring start for hedge funds, which turned in their strongest first quarter in 13 years, according to data released Wednesday. "Hedge fund capital posted sharp gains to begin 2019 as investor risk tolerance increased," said Kenneth Heinz, president of Hedge Fund Research, a Chicago-based provider of hedge fund data and analysis. HFR's index of hedge funds saw a 5.7 percent gain in the first quarter, the best since 2006. On the whole, total hedge fund capital recorded the fifth-highest level, increasing to $3.18 trillion. While hedge funds did see investor outflows of about $18 billion, the losses were offset by the performance-based gains of nearly $97 billion, HFR said. "It is likely that the hedge fund capital and flow cycle lags realized performance by several quarters as investors evaluate new allocations in light of recent performance," Heinz added. "We expect this process to contribute to continued asset growth and new investor allocations throughout 2019." The strong start to the year comes on the back of hedge funds narrowly outperforming the S&P 500 in 2018. 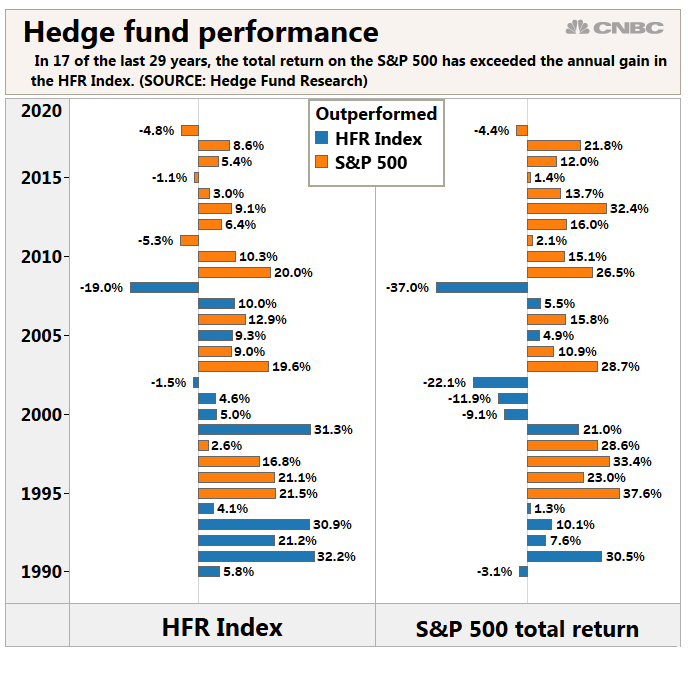 While both had an annual loss, HFR's index slid slightly less than the S&P 500 when including dividends. Last year was also the first time hedge funds outperformed the S&P 500 on an annual basis since the financial crisis in 2008.